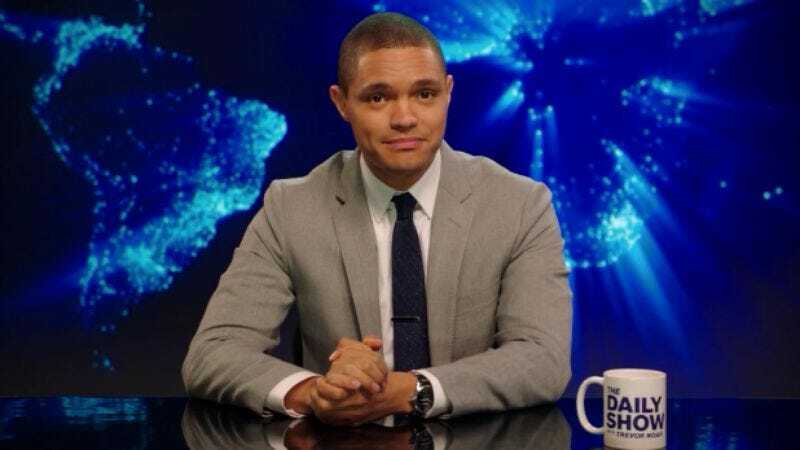 When Trevor Noah took over as host of The Daily Show, he did so gingerly, making sure to show plenty of gratitude and care for having been placed in the driver’s seat. But some changes were to be expected—there’s a new set (and chair height), for starters. Prior to his debut, Noah also said that the show would have a new perspective—namely, his—while keeping “the same endpoint.” He also suggested that he wanted to curb the show’s reacting to Fox News’ hectoring. This was all very fine and good, but would he keep the theme song?, many (probably) wondered. And the somewhat delayed (or rather, modified) response is no. According to The Hollywood Reporter, Noah and his crew rang in the first episode of the new year with a new version of “Dog On Fire” produced by Timbaland and King Logan. It’s a little faster than the version that They Might Be Giants crafted for Jon Stewart’s tenure, and is certainly distinguishable from the original that Bob Mould first played for Craig Kilborn. But we’re hard-pressed to find Timbaland’s stamp on the thing. Anyway, have a listen to the new and old versions below.